So it is just a matter to combine these for a very special boat. Not since the legendary F-25C have we been able to offer such an advanced boat, but with F-22 production now optimized and starting to ramp up it is a good time for something a little special - the best F-boat ever built. The F-22F is based on the F-22R, but with foils, all carbon construction, and many detail improvements. It has been in mind for a while as a concept boat, but it is also one that is very buildable. However, not a boat for everyone, and availability will be restricted. Coming on board to assist with the foil setup and control systems will be a long time friend Neil Wilkinson, who was the foil system engineer in the last America's cup with Emirates Team New Zealand, and also with Oracle when they won in San Francisco. Neil thus has extensive experience with winning 'state of the art' foils, plus has built his own F-22, so also knows the boat inside and out. The F-22F is designed to be an easy to use foiler for the real world, with curved foils that are fully retractable for light airs. This means there will be no need for a large rig to overcome their drag in very light conditions if unable to be fully retracted. Big sail plans are okay on a race course with rescue boats close at hand, or when in experienced hands, but not for the everyday sailor who may have family or inexperienced sailors on board at times. Once retracted the foils just stay in place when folded, so there is no need to remove and store for trailering. To be strong enough these foils have to be quite heavy, and can be awkward to handle, so not having to remove them for folding or trailering is big bonus. These curved foils also do not need a complex control system, with no need for a pole or lines going up mast to retract, nor is there any need for hydraulics. A simple pull up line is all that is required to the cabin side, and this is led back to a cleat, and can be winched also. A simple pull down line will extend the foils and hold them down. The F-22F foils are thus very simple and user friendly to use, and also practical for use in strong winds with large waves. without having to be overly long to lift the boat high above the waves. They are intended as a leeward buoyancy supplement, and as such can handle waves and rough conditions the same as the large ocean going French trimarans with their curved foils. There is no need for the boat to be lifted high over such waves, and this	avoids	the	bow	burying problems of high flying foilers when bearing away, or coming off the foils. Not really a reassuring characteristic with a cabin boat and family or friends on board. The F-22F will be able to fly, but more as a low flying foiler with leeward float just above the water. The foils will add significant buoyancy to the leeward float, and will still be capable of fully flying the F-22F at times, as has been proved possible with the F-32SR. The 2010 designed F-32SR was always intended to be foil assisted, rather than to fully fly, this not being a reality at that time. However, it proved possible with the first F-32SRs launched, even without a T foil rudder, but only at the risk of breaking the foils. These were a relatively small section, and could not be made strong enough for full flying at maximum extension. However, this will not be a problem with the F-22F, being less than half the weight of the F-32SR. The curved foils will still provide both windward and vertical lift when down, even if not flying. So even in light to moderate winds they will improve performance, and also tend to stabilize the boat in rougher conditions. In very light winds they can be down just 600mm (2') and being more vertical in this position, they will generate significant lift to windward, enabling the boat to point higher. 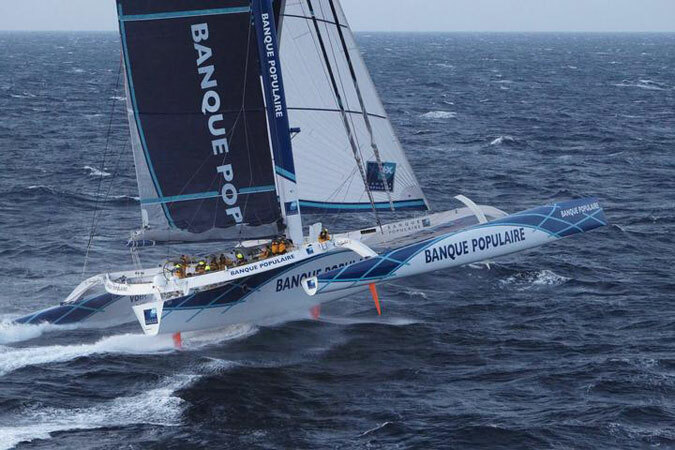 As the wind increases the foils can be extended, improving performance, until the float starts to fly giving a significant jump in performance. The circular retractable foils just offer more flexibility. The hard decision with the F-22F was one, two, or three rudders. Twin rudders, one on each float may seem the obvious way, but the boat would not be steerable when folded, unless a third rudder (extra expense and weight) was added to the main hull. The float rudders would also have to be removed for trailering, for obvious reasons as shown below. This would not be easy, both rudders being heavy and awkward to handle. One center retractable trim rudder looks a little more logical, this being lighter and a significantly less costly than three rudders. Plus it avoids a very complex steering system, that also needs to be able to fold, and has two horizontal trim foils (elevators) to control. A single central rudder can be made deep enough to where control can be maintained, and the horizontal elevator at the end stays deep enough to control trim, when flying on one or both foils. Two smaller float rudders will however be optional, just in case they are needed. The good thing about circular retractable foils and a single deep central retractable rudder is that F-22F can still be rigged and launched singlehanded with no need to fit or move heavy foils during the launching and retrieving process. The F-22F will also have a good usable amount of room, so can double as a very fast cruiser for when needed, and not lose all of its value once its race days are over. It will not need ideal conditions to foil, and will be an all round performer, with still excellent performance in both light airs and large seas. A truly practical but fast foiler, and one easy to use. Foil cases will be larger than the original cases used on the F-32SR, to enable more fore and aft rake control, and they will now have removable bearings in the bottom. This will allow foil sections and type to be changed in the future to suit purpose, if ever warranted. A Southern Spars carbon wing mast will be standard along	with	all	carbon	and foam core construction	with	a	vinylester/epoxy resin, to achieve the light weight necessary for any foiler to be successful. Exterior	finish	will	be	gelcoat, with	a light hand laid csm back up layer, for real world durability. The base color will be white, and a vinyl wrap exterior finish will be optional with unlimited color and graphic options. Curved float lifting foils were first used on the original F-27 back in 1985, but were discarded as being too expensive, and they were probably too big of a leap at that time. The F-27 itself was radical enough and something even more radical as lifting foils could have been too big of a distraction. Photo above shows the curved foils on F-27 #1 just behind the forward beams. These were only in use for a short time, but were used in one heavy air race, with large 4’ to 6’ seas, not the best conditions for foiling multihulls. However the F-27 won the race. Rig and sail plan are the same as the F-22R. be reserved for a 10,000 deposit. Renderings by Mike Annear. F-22F is a trademark of Ian Farrier.